The Asian Golf Industry Federation (AGIF) will stage a minimum of seven turf grass seminars in 2018. In the coming months, Indonesia, Malaysia, the Philippines, Taiwan, Thailand and Vietnam will all host AGIF-organised educational events. Eric Lynge, the AGIF’s Chief Executive Officer, said: “Last month we launched a Certificate in Greenkeeping (CIG), the first of its kind in Asia. Aimed at supporting education among golf course superintendents and improving conditioning of golf courses, the initiative is backed by The R&A, the game’s ruling golf organisation. “The objective is to be able to offer an accessible, affordable and internationally recognised certification for superintendents. Our turf grass seminars and field days are a key element in our plans. “That we’ve seen a steady increase in attendance at our these seminars in recent years is testament both to the quality of the speakers and the growing thirst for knowledge among superintendents, greenkeepers and mechanics around the region. This year’s series of seminars and field days will tee-off at Laem Chabang International Golf Club with the Federation’s Turfgrass Management Exposition on March 13. More than 250 course superintendents and club managers from 20 countries are expected to attend the sixth edition of the event that will showcase the very latest in golf course equipment and machinery. Held under the auspices of the Thai Golf Course Superintendents’ Association, the Expo is part of a three-day gathering in the Central Thai beach resort that is highlighted by a high-profile conference on Sustainable Turfgrass Management in Asia. Maintaining its traditional date in the calendar, the Philippine Golf Course Management Conference will be held at The Orchard Golf and Country Club, a Golf Facility Member of the AGIF, on May 3-4. Organised by the Federation of Golf Clubs Philippines in co-operation with the National Golf Association of the Philippines and supported by the Philippine Sports Commission, the two-day event in Dasmarinas City is presented by the AGIF. Representing 30 golf clubs across the Philippines, more than 120 golf course superintendents, course maintenance managers, golf directors and club managers are expected to be present. From Manila, it’s onto Ho Chi Minh City on May 10 for the first of two Turfgrass Management Seminars in Vietnam this year. The venue will be announced shortly. A thirst for knowledge among attendees at AGIF Field Days is increasingly evident. Following a mid-year break, the series will resume with the ASPGI (Asosiasi Superintendent Padang Golf Indonesia) Turf Management Seminar at Rancamaya Golf and Country Estate on August 13-14. The second Vietnam Turfgrass Management Seminar will take place in Hanoi on September 20. 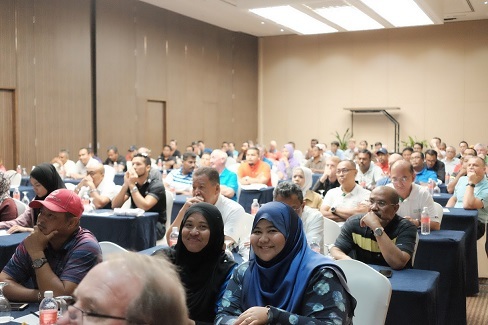 The fourth Golf Course Superintendents Association of Malaysia (GCSAM) and AGIF Turfgrass Management Seminar is set for September 26. Organised under the auspices of the Malaysian Golf Association, the venue for the seminar and field day will once more be the award-winning TPC Kuala Lumpur, an AGIF Golf Course Facility Member. Lynge said that plans are also afoot for a Taiwan Turfgrass Seminar in October. “We hope to confirm details in the coming weeks,” he said.